If none of you have seen on the Warhammer community site they posted an article detailing the new generals handbook which they are taking our opinions on. If anyone is interested the Warhammer Age of Sigmar Facebook page has a post on which you can comment what changes you would like to see points wise and other ideas. I know many of you don’t play AoS here, but for those of us that do we should all voice our opinions on the Dispossessed to see if we can get them some love in the newest General’s handbook. Yeah, I'm not on Facebook either, though my sister keeps trying to convince me to go to the Dark Side and get on it. That said, we should look at what things can be done to make the Dispossessed relevant, because right now they aren't. We should also convince Gdubs to include the Dwarfs with the Dispossessed, so we aren't trying to figure out how to ally with ourselves as it were. Bad enough we have to do that with our own Artillery units (Cannons, Organ Guns) and what few toys we have (Gyrocopters), but we should have access to our Miners and the Slayers (real Slayers, not nekkid-baby with metal tats pseudo-slayers), and our other troops. We should also have our Engineers again to buff our guns. I understand they want to push their plastic troops and sell their newer stuff, but some of us still have our old pewters, and we shouldn't need the permission of our opponents to use them. That’s all very true and much of what I mentioned in my comment on there Facebook post. I also mentioned getting rid of the ancestral pickaxe and making it a once per character ability, being a part of the allegiance ability. If that was the case we would normally have about 2-4 units being able to move per game and I think that could make us much more competitive. Yeah, especially if we consider that Seraphon can teleport units once / twice each round across all the battlefield, while we have to rely upon a single-use pickaxe(given that things as bugman's rangers and miners have been removed). All in all, it sounds like a bad joke. I already send GW an email regarding our runic icon and the interaction with endless spells. We ignore all spells on a 5+ even if we dont want to, this means we cant reliably use the chronomatic cogs to buff our speed. I proposed to change it to "can roll a dice and ignore on a 5+" or only "enemy and hostile spells". Sadly it wasnt mentioned in the last FAQ. I also think the teleporting via every hero is a nice idea. I also thought about a allegiance ability similar to the gravesites of death, only that we get tunnel exits/entrances. We could also get additional ones via the use of the pick axe (one while leaving and one while entering the table) aswell as miners when set up via their ability. I also think they should bring back miners as they had their own plastic sets. We just need some more mobility. If the runic icon rule gets changed i also think that collegiate arcane would be a good ally for us (and all other City factions like free people and darkling covens) and it would make alot of sense with endless spells. We could realy use a hurricanum plus chronomatic cogs or some of the diffrent wizards. I also think if the cost for our battalion (both in units and points) wasnt so high we would realy like to play order with all our tools since we get all our allegiance abilities. If multiple of us propose our ideas to GW they might consider it. It seems that this year GW's Plans are renewing many battletomes with endless spells (like Beasts of Chaos). Perhaps we'll get endless spells runes?I can see this both fors Dispossesed and Fyreslayers...not for KO though(perhaps something like Endless spells but "lorewise" just mechanical things). This year could be interesting for all the three Dwarf armies though. For the GHB: we need our warmachine's back, perhaps adding them the dispossessed keyword (and human's ones the Freeguild). Gloomspite Book is a step in that direction giving more keywords still uniting three subfaction as one. Edited by Snorri Fireaxe, 08 January 2019 - 06:03 PM. A Rune of Eternity perhaps?! Conventional endless spells aren't the only option. For example, in the AoS2 book, there's mention of the golemkin. It might not be beyond belief that the duardin spells are actual golems (etc). It makes me a touch uneasy though - Tolkienic dwarves have a touch of an issue with being an unsubtly crude allegory (a homelandless diaspora, expert craftsmen, obsessed with wealth), and Warhammer Dwarfs had managed go to great lengths to eschew that overlap and build something greater than mere allegory. Edited by Xisor of Karak Izor, 20 January 2019 - 10:12 AM. Golems are a staple fantasy trope though, i don't think would become an issue because they are made by the GW dwarfs (that never had those allegories from Tolkien anyways). IIRC Gholemkind are linked to Chamon and perhaps to some extent to Grungni (as some humans also follow him and even Ogors): i don't remember if they were actually created by him but i could see them as a new unit\allies with the dispossessed armies perhaps. Still for endless spells i would say that Runes would be the way to go, IF they'll ever get them (i'd prefer not): perhaps the Necroquake charged so much the magic in the realms that Runes can have "a disjointed spell" from the rune itself. And i don't think dispossessed will be "souped" with elves and humans: the site put them in a separate entry (while old world elves save DOk are under the section "elves" , hinting perhaps to a unified battletome) and they still have enough kits (maybe also getting back thing from the Ironweld). They could get the DOK treatment ( some new units kits) perhaps with a Grungni model..Gloomspite Gitz gave me the feeling that old armies left will be supported in some way in the future. Also the many references in the Gloomspite models of Dispossessed is another hint (imho) in that way. Edited by Snorri Fireaxe, 20 January 2019 - 10:31 PM. Calling the Tolkien dwarves an unsubtle allegory is like calling Death and taxes are 'sure thing'. The movies didn't help in that regard. 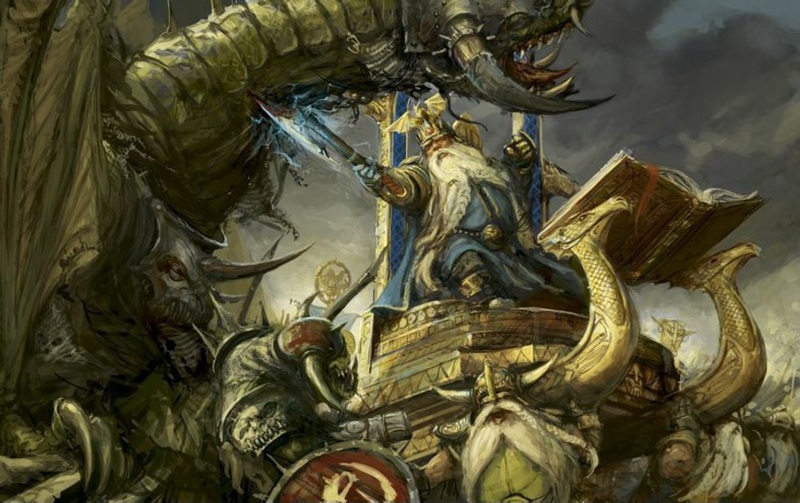 I'd be happy to see the Dispossessed, 'Dwarfs', and the Ironweld Arsenal made into a cohesive faction, as right now, we're scattershot all over the place, and while I don't mind having Fyreslayers and the Kharadron as allies, we shouldn't need them to have a decent, competitive fighting force. Endless spells are fine for other armies, but that won't work for an army which is distinctly non-magic using, and I shouldn't need to have some Stormcast parked in my backline to swat down extra magic for me. Maybe we need Runelords with some super-rune allowing us to kill Endless Spells, or maybe buff an Anvil of Doom to do it, and thus get some mileage out of models collecting dust. Having golems, or Earth Elementals we can control would give us a rock-hard (pun intended) units we could use as a linebreaker and be that centerpiece unit we currently lack. Heck, the folks at Mantic Games make such things for their dwarves, GW could do the same. Hmm, I've other reservations around the notion of the dispossessed as, err, dispossessed too. It's a trap that latter-day WHFB fell into too: overlooking the distinctiveness of the varieties of dawi. Hill-dwarfs, dwarfs more-or-less fully acclimatised to the Empire, to Bretonnia, to Marienburg, to Kraka Drak and Karak Norn - the places much further from Karaz-a-Karak. "BATTLETOME: DUARDIN" could focus on the major city-states of the storyline - Hammerhal and Tempest's Eye and whatnot - as primary allegiance abilities. Add in a couple of extras for the outliers - vengeance-seekers (a la Bugman), or under-funded Reclaimators (a la Ironhammer at Eight Peaks), and that already would allow the Dispossessed, Dwarfs and Ironweld to be brought together. For endless spells - they might wish to tweak the rules a touch - more akin to sets of magical (err: runic) terrain pieces. - Ancestor-Golem - a monstrous, rune-animated image of an Ancestor or Ancestor-God. - Ghostly/mummified ancestors: vengeful tomb-spirits resenting the pilfering of their resting places. Recall the particularly special Rune of Doom effect? - An actual runic duardin wall. Special spell defences, but it's a simple wall with runes of power to grant special effects on it. - Runic gateways (well, Realmgates/Gnaw-holes of Runelord fashioning), sally-ports, mine-shafts and whatnot. The first two are plausibly entirely new units though, so maybe I shouldn't be in charge of ideas. I think the difficulty I have is in seeing the line between 'cool and fantastical' in the AoS2 style, whilst also preserving the 'none of that magical nonsense' sense of the Dawi of old. For all that - I'd be a sucker for the presence of some rinn amongst new models, some fantastical miners, and an Ancestor-Golem kit. And on that last bit, given the whole notion of the realms in Age of Sigmar, I imagine it's less a question of "how do we animate statues and make it seem dwarfy" and more a problem of "please stop carelessly making statues, they keep wandering off". Given that GW is giving models for endless "spells" also to Khorne, to tweak some rule shouldn't be a problem. The problem is that in Las Vegas Open 2019 there were no hints to anything that could be vaguely dwarfs-related. Edited by Killer Angel, 09 February 2019 - 10:53 AM. Yeah pretty much sure we won’t see anything for Dispossessed this year, except for another entry in the generals handbook. Maybe next year then. In the meantime, Adepticon blesses us with an update for Fyreslayers, with "magmic invocations", a fantastic piece of scenery (the Forge, which can be really used in every dawy terrain), plus a warband for KO. I'm pretty annoyed Fyreslayers didn't get new units (they need those) but it seems it will be the same for many battletome..still at least a repack of the Heartguards as they have too few models imho (perhaps also decreasing price of singular pieces, they did the same wth Stormcasts at some point as units increased from 5 to 10). KO warband is good but i wanted the Khemist with the pose like in the artwork (clenched fist to cease fire)...it was a really good idea. Edited by Snorri Fireaxe, 30 March 2019 - 01:56 PM. I'm pretty annoyed Fyreslayers didn't get new units (they need those) but it seems it will be the same for many battletome.. Yes, it seems the actual tendency by GW is to rewrite the battletomes, avoiding the introduction of new models (barring few exceptions). A pity, it's an approach that (while helpful) imo doesn't work so nicely with armies that have few models from the start, as the basic problem will remain.